Equal Tees, offered by us, are manufactured using quality approved metals that are procured from the trusted sources of the market. We make available Equal Tees in various sizes and finishes to choose from. Our Equal Tees can withstand high pressure and temperature. 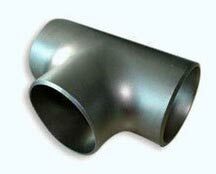 Our ANSI B 16.9 grade Equal Tees can easily connect pipes of different diameters. One can place retail as well as bulk orders for Equal Tees with us.